The Order of the Arrow signet ring features a round logo top and antique finish. Personalize this ring with side engravings. Top dimensions: 15.2mm x 15.2mm. 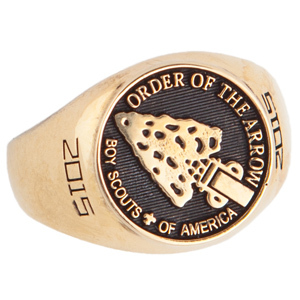 This ring is officially licensed by the Boy Scouts of America. Handcrafted to order. Made in the USA. Manufacturing Lead Times: This jewelry is made to order, requires sizing, or assembly before shipment. The "ships in" time refers to the time it takes for the jewelry to be made to order, inspected for quality, packed and prepared for shipment. White Lazon™ is a silver toned, non-precious metal alloy. It contains nickel with chromium alloy. The specific alloy composition is subject to change. Yellow Lazon™ is a gold toned, non-precious metal alloy. It contains nickel with chromium and coated with titanium nitrate and minute amounts of gold. Electrodeposition is used. Yellow Lazon™ is yellow in color because of coating with 23 karat yellow gold. The specific alloy composition is subject to change. A precious metal alloy composed of 76% silver, 10% platinum, and 14% other metal alloy. No nickel! SilverXT™ is coated with rhodium plating which provides protection to help minimize tarnish and scratches. SilverXT™ contains platinum so the metal is highly durable with a brilliant shine. A metal alloy composed of 17% gold, 21% silver, and 62% other metals. Amber XT™ DOES NOT contain nickel. The metal alloy is yellow throughout and is not plated. It is a brighter, more lustrious finish than the yellow Lazon™. Amber XT is a radiant yellow 6K alloy. Amber XT is a solid yellow metal that offers another affordable alternative to yellow gold. This dazzling metal combines affordability, beauty and durability, so memories will last a lifetime. Amber XT™ is also covered by Gold Lance's Lifetime Limited Warranty and Ring Protection plan.